Jensine's "Good as New" Merchandise is a general goods store located in the Imperial City Market District. 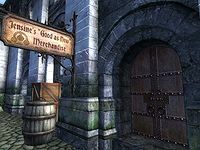 It is found across the street from The Merchants Inn and A Fighting Chance and next to Three Brothers Trade Goods and the Warehouse. The proprietor, Jensine, has 600 gold and a Mercantile skill of 30. When bartering, she will buy anything from you while only selling a variety of miscellaneous items and the unique Akaviri Warblade, with damage Fatigue, Magicka and Health enchantments. Jensine's "Good as New" Merchandise is divided into three areas: Jensine's "Good as New" Merchandise, Jensine's Private Quarters and Jensine's Basement. The main trading room is on the ground floor, and consists of a counter and a selection of Jensine's wares on display. This truly is a merchandise store, as the exhibited wares include everything from pure clutter to fine jewelry. The store is brightly lit from the many windows, and the walls are covered with brown carpets. Also, for decoration, the walls display a few hunting trophies: two deer heads and a minotaur head. The exhibition tables are made of raw wood and contains mostly clutter: paint brushes, cloth, yarn, some shears, tongs and a pickaxe as well as two silver pitchers and assorted dishes. 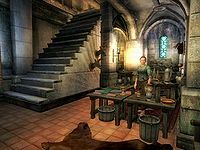 In the back, the small table has some more valuable stuff on display: A repair hammer, a green silk garment and three pieces of jewelry; two copper amulets and one jeweled amulet. The lectern here holds clutter, and a barrel holds various gardening tools. It's the only container in this room and it's safe. Also on display are two easels and a lot of paintings. Jensine lives upstairs, as is usual with Imperial City houses and stores. 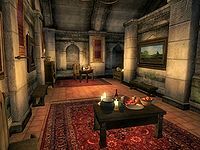 Her private quarters consist of a single room, which serves as a dining room, work-room, and bedroom in one. The door opens to the sight of a candle-lit table with three apples, two samples of elf cup cap and a bottle of Tamika's West Weald Wine. On a bench lie copies of Report:Disaster at Ionith and Brief History of the Empire, v 4. Against the opposite wall, some shelves holds clutter and a sack with clothing. The sack doesn't respawn. The dinner table nearby seats only one, but hold a wide array of food: one potato, one ear of corn, two cheese wedges, two apples, three radishes and four blackberries. At the foot of the bed, the chest of drawers holds clothing. Halfway down the stairs, you will meet two crates with clutter and a chance of a few gold pieces. 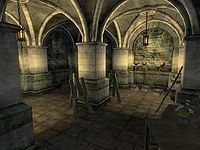 In the basement area, along the wall, a kennel holds a sack with clutter, and next to it, another sack with a slim chance of some gold. These two sacks are safe containers. Following the wall, past the pitchfork, another barrel with clutter. In the next corner, yet another barrel with clutter and a bowl with three pieces of yarn. In the middle of the room, near the easel, lies a single repair hammer. In the last corner, a barrel and a sack (another safe container) with clutter and a chance of a lockpick, a torch and/or some gold. I needed some cash, so I went to see Jensine. If you need money fast, try Jensine's. You can sell almost anything there. This page was last modified on 9 November 2018, at 15:22.